Donate- I would like to financially support your ongoing efforts. Volunteer Drivers make A Simple Gesture possible. Drivers are asked to pick up about 20 bags in or near their neighborhood every other month and deliver the food to an assigned food pantry. It is great to take a friend or the entire family- kids love this job! 2. At the beginning of each month, you will receive an email to ask if you can volunteer that month. If you aren't available every month, no worries, volunteer when you can! 3. If you are available, we will assign you about 20 houses and send you a route with directions to each house, ending at an assigned food pantry, and a spreadsheet with the contact information for the houses you are assigned to. 4. Call or email each person on your list to remind them that you are coming, and get any special instructions (some people may be out of town, or might leave their bag in the carport), this is a great time to get to know your neighbors! 5. Pick up your bags at the assigned time. (Usually the Friday before the pickup and/or Saturday morning). 7. Congrats! You picked up an average of 400 pounds of food! What a great way to spend a Saturday morning! 8. *We also have opportunities to pick up on Friday mornings, and Tuesday mornings. If you are interested in that, let us know! 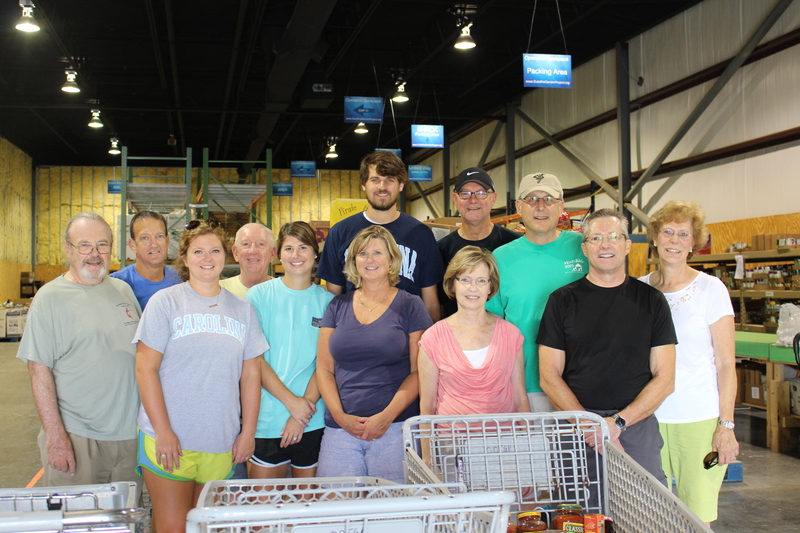 Food Sorters help us weigh and sort more than 15,000 pounds a month! It's a huge help to our partners to make sure that the food collected gets to hungry kids and families as quickly as possible. This is a great job for individuals or groups. At the beginning of each month, you will receive an email to ask if you can volunteer that month. If you aren't available every month, no worries, volunteer when you can! If you are available, we will assign you to a pantry. Come from 10-12:30 and wear your close-toed shoes. You will help unload cars, weigh food, sort food into rough categories. You will also get to know some amazing other volunteers in the community and have a wonderful time making sure food gets to community members who need it the most! A Simple Gesture depends on volunteers for nearly everything we do. If you are interested in helping with anything from office work, recruiting new donors, fundraising or anything between, let us know! Our goal is to match volunteers and their passion and talent to needs that we have. We are always looking for committed and passionate people to work with. Contact us and we will get you a coffee and discuss how you could be a great fit!